Railway Athletic won the Division Two title. In a midweek game at title-chasing Spilsby Town, the home side boosted their goal average with a 5-0 derby victory over Skegness Town Reserves. An Eddie Rich penalty got Spilsby up and running early on before further first half goals from Liam Papworth and Dan Cobb put them in a commanding position. Michael Hardy’s second half double secured a comfortable home win. Another midweek game at Heckington Millers saw the home side gain another three points following their 3-2 victory against Swineshead. Dom Kew’s double and another from Sam Elliott did the damage while the visitors replied through Bert Snaith and Jack Houghton. Heckington then produced possibly the shock result of the season when they comfortably swept aside leaders Wyberton Reserves 5-0 on Saturday. Skipper Dominic Kew scored his 27th and 28th goals of the season while the other match-winning goals came from Joe Braithwaite, Tom Best and Sam Elliott. With Thursday night’s Willoughby Cup Final at the back of their minds, both Old Leake and Spilsby Town didn’t give much away in their league encounter last Saturday. Town had the better of the first half but were wasteful in front of goal and Leake goalkeeper Ben Henderson pulled off some good saves only to be finally beaten despite keeping out the initial two goal-bound efforts before a third rebound was finally tucked away to make the half-time score 1-0. Spilsby seemed to be content to try and hold onto their slender lead but their tactics came undone with five minutes to go when Patrick Kacirek fired in a free-kick and Scott Mackay headed home the equaliser. It could have got worse for the visitors when Old Leake regained possession from the kick-off and, after Scott Mackay had headed on for Adam Tempest to scamper through and score, the referee had already rightly blown following the eariler clash of heads involving The Old Leake striker, Mackay. 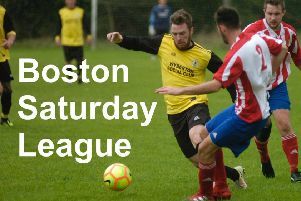 Coningsby clinched a late victory to grab a narrow 1-0 Premier Division success over Benington on Saturday. Both sides had chances with the visitors seeing two efforts hit the home crossbar while stand-in Benington goalkeeper Ben Newton pulled off several superb saves to keep the scores level. Benington’s hopes were dashed late on when Coningsby’s Martin Maddison grabbed their winner with just five minutes remaining. Swineshead’s strike-force were again firing on all cylinders when they won 6-1 at Skegness Town Reserves. Bert Snaith hit a hat-trick while the other goals came from Mark Sharman, Jack Houghton and Rob Masters. Fierce rivals Wrangle and Freiston locked horns for the second successive week and, this time, it was Wrangle who gained revenge for their previous mauling. Troy Ayton got on the score-sheet for Freiston but Wrangle hit back three times to run out 3-1 winners. Railway started there run of midweek games with a Thursday night trip to Sibsey knowing full well that a win would leave them only needing three more points to wrap up the Division Two title. A very strong Railway side started the game slowly with both teams battling to get control of the game but it was the visitors who struck first when, following a move on the right hand side, the ball was played across for Damien Gibbons to fire home from the edge of the box. Sibsey equalised early in the second half when a cross was only half cleared and a shot was driven in from edge of the box. The game appeared to be heading for a draw until some real quality from Billy Shinn saw him brought down in the box and Curtis Yeatman fired home the resulting penalty. As Railway looked to close the game out, in the final minutes some good work from Danny Woods on the left wing put in Yeatman who then found Billy Shinn to fire home to make it 3–1. Railway Athletic entertained Coningsby Reserves knowing three points would seal the Division Two title. After a cagey start, Railway through they should have been awarded a penalty when a Coningsby player blocked a goalbound effort on the line with his arm, but no punishment was taken. In the second half Curtis Yeatman fired home left footer from the edge of the box before Coningsby made it 2-1 from a header and some poor defending. This livened the Railway up, Liam Nimmo maing it 2-2. With three minutes to go, Steve Appleby rose to find the net with a header, securing the points and the title. Kirton Town Reserves and Fishtoft Reserves provided a very close game at Graves Park in midweek until the last 20 minutes of the game. In the first half Kirton looked the better of the two sides and created chances but failed to capitalise although Fishtoft did improve towards the end of the half. In the second half Fishtoft’s midfield and forward line began to get into the game with some direct running at opponents but could not find a way through Kirton’s stubborn rearguard. Fishtoft tired in the latter stages and Kirton got men in behind Fishtoft and started to create opportunities although, it wasn’t until the final 20 minutes before the home side finally found the crucial breakthrough when Mateusz Stepien beat the right back for pace and then cut back inside and firing the ball in the top corner. Shortly afterwards a long ball over the top sent Chris Hilton scampering through and he slotted the ball home to make the final score 2-0. Fishtoft Reserves got back to winning ways a few days later when they entertained Mareham United thanks to three second half goals from Lewis Cartwright. The first half began brightly with both sides looking for a breakthrough and Fishtoft were soon rewarded for their efforts half way through the first half when an inswinging corner from Casey Sullivan was met by a bullet header from a Mareham defender who could only direct it into his own net. As Mareham kicked off, Fishtoft quickly won the ball back and walked through the defence only for their effort to go wide. From the resulting goal kick Mareham went up the other end and almost had an equaliser only to be cruelly denied by the woodwork. Fishtoft cranked it up a gear in the second half and Lewis Cartwright’s blistering pace saw him get away from his defender and slot past the keeper after a long ball was missed by the Mareham back line. With 20 minutes remaining Lewis Cartwright again got past his defender and rounded an on rushing keeper before slotting home with his left foot and, 10 minutes later, Lewis Cartwright completed his hat trick with another left footed drive from the edge of the box which crept into the bottom corner. Eastern European FC looked to be heading for victory in their home encounter against Park United when they found themselves 3-0 ahead at the break before the visitors staged a remarkable comeback. Park United started as if they were already on their summer break when they conceded three goals inside the opening 30 minutes. Park were given a lifeline when Chris Wright scored from the penalty spot just before half time. After the half time team-talk Park returned a different team and two goals from Junior Samra brought them level and then, with 15 minutes left, Alex Limb scored the winner to make the score 4-3 and complete a startling fightback. Holbeach Bank had a welcome home win when they played hosts to Pointon Reserves. Goals came from Jonny Wiggins (two), Stefan Belakov, Steve Parker and Dave Wilson. Kirton Town Reserves and Sibsey produced a real goal feast at Graves Park. Not many teams will score five goal at home and still finish up on the losing side but that’s just what happened as Sibsey replied seven times to run out 7-5 winners. Town’s goals came from Andy Brown, who grabbed a hat-trick and Bailey Noe who scored twice but it was all to no avail. Ben Gilbert was on target for Billinghay Reserves in their home match against FC Kirton, but it was the visitors who returned home with the three points following a 2-1 away win. The big clash between FC Hammers and Spilsby Town Reserves finished all-square at 3-3. Liam Ingamells gave the Hammers the lead before Town hit back with a hat-trick from leading goal-scorer Travis Herberts to lead 3-1 at the interval. The Hammers stormed back in the second half to salvage a hard-earned point with goals from Aaron Modley and Scott Bates. Old Doningtonians Reserves bounced back from 1-0 behind at the halfway stage to take all three points when they played hosts to Benington Reserves. Kieran Gatenby had put Benington in front during the first half before Chris Grimer got the Dons back on level terms after the break and Luke Barnett snatched the winner with 10 minutes remaining. A single Patryck Filan goal earned Spalding Harriers a 1-0 victory in their home match against Wyberton A.
Benington lost their grip on the Fishtoft Cup as Wyberton Reserves completed the first leg of a potential trophy treble in last Thursday’s final at Boston Town. An evenly-fought contest of few chances saw Wyberton go closest to breaking the deadlock in the opening half when Chris Rutt headed a corner against the post. Benington threatened on several occasions without really troubling Wyberton keeper Scott Williams and the Premier Division leaders took the lead midway through the second half when substitute Nicky Syndercombe latched onto a loose ball before curling his shot past Benington goalkeeper Phil McAllister. Wyberton then wrapped up their victory in the dying stages when Jonny Butler fired home an audacious long range effort. The man of the match award was given to Wyberton Reserves’ Jake Beauchamp. On Thursday The BB Insure Willoughby Cup will be staged at Boston Town’s Tattershall Road Ground, between Old Leake and Spilsby Town (KO 7pm).